Taking your family to ski, easy as ABC! Friends say taking the family skiing is too much work, I respectfully disagree. It is worth it, by far the best family activity in winter. As the late Michael Jackson sang, “ABC, it’s easy as 1, 2, 3.” We are here to help you pack for skiing, and find The Best Ski Resorts in New England for Families or the Best Family Ski Resorts Out West in Canada and Europe. Avoid cabin fever, skiing families don’t suffer from sunlight deprivation or “shut in syndrome” in January. Be a cool parent and teach your kids a lifelong sport that you can enjoy together. Celebrate winter in New England instead of dreading it. Don’t worry if your ski suit doesn’t match, this is New England not Deer Valley. Eat hearty, skiing burns tons of calories. Go downhill and enjoy the pull of gravity. Hot cocoa tastes best after a few frosty ski runs. Introduce a friend to the sport of skiing, they should be forever grateful. Jumps are fun, start small and build up to bigger. 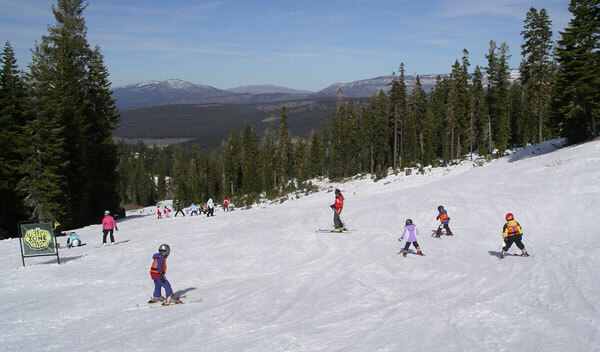 Kids learn quickly, start yours’ on skis now. Learning a new sport increases brain activity, improves reflexes and balance. Nippy weather keeps skiing families close together. Open snow covered slopes await your ski signature. Carve ‘em up. People who ski live longer, and have more fun. Quit whining about the cold, and get out and enjoy it. Recreate with your family, a day at the Snow Bowl beats a bowl of chips every time! Snowflakes pile up into a fluffy blanket on ski area trails just waiting to be skied. Take time to enjoy the scenery. Standing on top of a snow covered mountain is inspiring. Unplug from your electronics and chat with your kids about today’s best run. Volunteer at a Handicapped Skiing club, at a local ski race or event. Wear layers and you will be ready for whatever Mother Nature has in her bag of tricks..
eXpect to be tired, there is satisfaction in muscle fatigue after a day on the slopes. Yield when entering a trail and know the 7 point skiers’ responsibility code – it makes for a safer ski day. Zip down the hill, get on the lift and do it again..